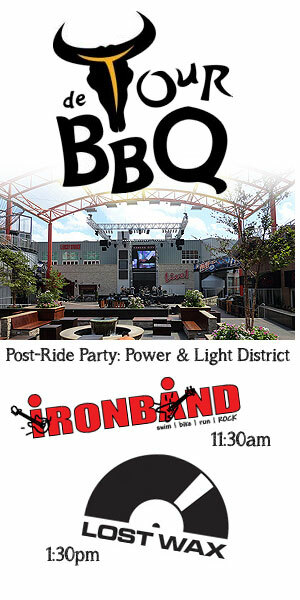 IRONBAND is honored to be a part of the post-ride entertainment for the fourth annual Tour de BBQ. The Tour de BBQ is an annual fundraising cycling event that supports the LIVESTRONG Army of Kansas City. Funds raised through this year’s event will go to support critical research programs at the University of Kansas Cancer Center. Riders can opt for 15, 35, or 62-mile rides, raising money for each mile they ride, and enjoy tasty BBQ from numerous KC BBQ restaurants as well as cold refreshments from Kansas City’s Boulevard Beer. IRONBAND will be on stage in the Power & Light District during the post-party as riders finish and we will be followed by local favorites, Lost Wax. There is still time to register if you want to participate as a rider, but the post-party is open go the public so grab some friends and come on down to the Power and Light District and catch us at a kid-friendly event (and time). We promise to stick to our PG-rated setlist. To register or for more information about the Tour de BBQ visit their website and stay tuned to Facebook for the latest updates.